My family prints a lot. We have two printers in our home, one business and one personal and let me tell you. Between business reports for 3 different companies, financial reports, homeschool worksheets and records and the everyday day to day printing we do, I could easily go broke. As our printing needs have increased over the years, I’ve had to learn how to save money on printer ink in different ways. I’m sure your family is the same way. Ink can be incredibly expensive and if your family prints as much as mine does? I feel your pain. 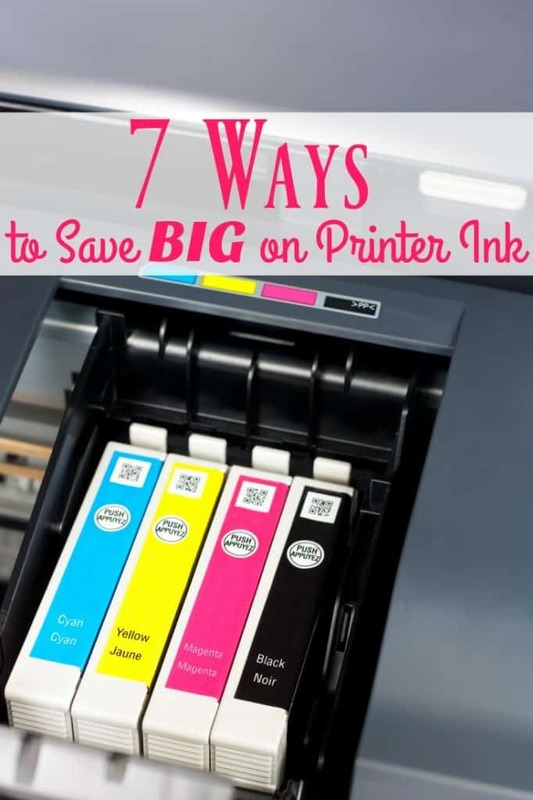 When you’re looking for ways to save money on printer ink, a lot of the time you’ll find that you are given the same tips over and over. 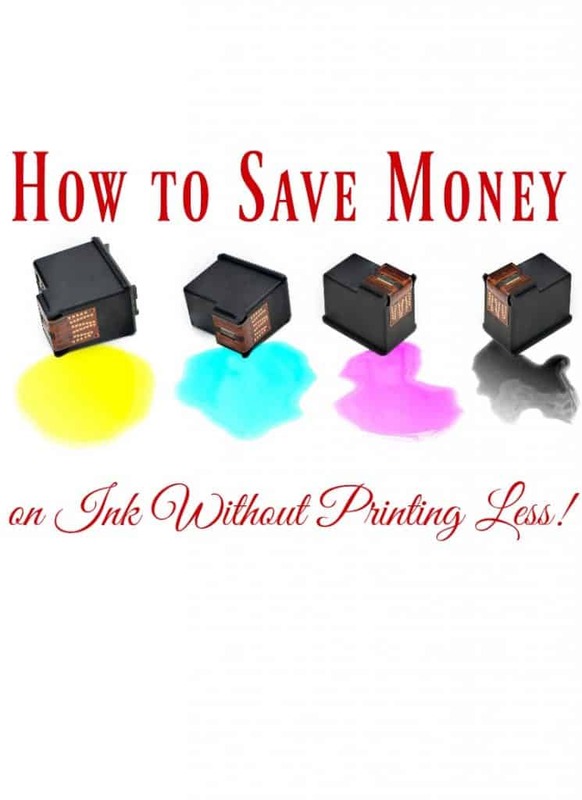 “Print less.” “Stop printing.” “Use an ink refill kit.” While those tips are all great ways to save and they absolutely will help you save money, sometimes you just need more to really push your savings to the level that you want it to be. It isn’t that those savings tips are bad…its more that they simply won’t help you push past a savings plateau. Just in case you’re not actually doing those tips, now is a great time to start. Yes, printing less will save you money. Yes, using an ink refill kit will save you money (and potentially dye your hands if you’re me). Once you’ve got those tips in place, the ones below will help you continue to save. 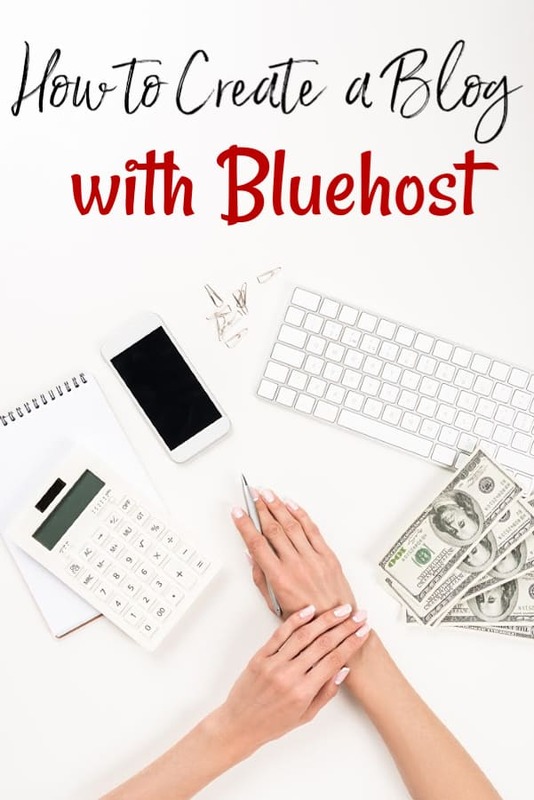 You can also earn free gift cards to pay for your ink using my system for earning $225.00 each month to save money if you’d rather just not mess with actually working toward saving more money (although if you feel that way, I question why you’re on this blog and especially this post). Our personal printer is an HP Envy wireless printer and while I absolutely adore it, the ink for it runs almost $20.00 for the black and the tri-color cartridge is even more expensive. Luckily, HP has an amazing program that really helps drive our cost down. How much? With the HP Instant Ink program, we pay no more than $9.99/mo for our ink. That allows us to print 300 pages per month. Not that we ever have, but if we would happen to go over that, we would only pay $1.00 for every 25 additional pages. Package prices start as low as $4.99/mo so it really does offer huge savings and since it is personalized to your printer, you never pay for more than you actually use. When our Instant Ink cartridges are near empty, our printer will order new ones for us. Since we already pay monthly, we don’t have to worry about paying high prices for new ones! They even offer a free month of printing for new customers so that you can make sure that you like the program (you will) and yes, it is a 100% totally free month. Recycling helps us all and saving money is just one benefit. Both Office Depot and Staples have really nice printer ink recycling programs that offer great rewards. They both work pretty much the same way. Recycle your ink cartridges, earn savings. With the Office Depot Ink Recycling Program, you’ll earn 200 reward points for each cartridge you recycle, up to 10 per month. You do need to make a $10.00 minimum purchase at Office Depot to get your rewards, but honestly, that’s fairly easy to do. You can cash out your rewards points once you reach 1,000 points ($10.00 value) for rewards certificates. With the Staples ink recycling program, you’ll earn $2.00 in rewards for each cartridge that you recycle (up to 10 per month). With Staples, you need to spend $30.00 within the past 180 days (6 months) to qualify. Both programs also offer savings in other areas too so even if you’re only going to recycle at one, it can be worth it to join both. If your printer isn’t eligible for a program like HP Instant ink, you’re likely stuck buying new cartridges. No worries, because you can still save a good bit of money by using a discount ink website like 4inkjets to buy your ink. Using a site like this can save you considerably over buying your ink at a big box store or paying regular price online. When you shop, be sure that you check for any online coupon codes or that you use a cashback site like Ebates to earn cash back on your purchase if it’s eligible. If you’re not familiar with Ebates, they will pay you cash back for shopping online which can be a fantastic way to save money on printer ink or just about anything else you purchase. They’ll even give you a free $10.00 gift card of your choice if you’re a new customer when you make your first $25.00 purchase. While we love our HP Envy for family printing, I wouldn’t dare try and print my business documents with it. We simply print too much with it. Instead, for business, we use a Brother laser printer. Laser printers will cost you significantly more to purchase and the toner cartridges are more expensive, but the number of sheets that you can print with one is huge when compared. My laser printer gets over 1,000 sheets printed per toner cartridge which saves me a huge amount of money. On top of that, there are toner refills that can make things even cheaper. I can generally refill my toner cartridge twice for $9.00 each before I have to purchase a new one. I’ve also found that toner refills are a lot less messy compared to ink refills. If you find that you’re printing a lot, look into a laser printer to see if it is right for you. This one may seem counter-intuitive, but hang with me for one second. Recently, I needed to print the entire first unit of my Emma’s science curriculum. If you’ve never looked at homeschool curriculum, the student books are usually rather large. Because of this, I didn’t want to use our HP Instant Ink pages. It would have put us over our 300 page limit for the month as well as cost me $1.00 for every additional 25 pages that we printed until the new month started. To keep that cost down, I had Office Depot print and bind it for me. It cost me $11.63 to have done. We picked it up in less than 12 hours and it was good to go! If you’ve got a large job to print, check into how much it would cost to let someone else do it. You may just find, like I did, that it is cheaper to let them do it. Plus? If you use Ebates like I mentioned above, you’ll save even more in the form of cash back. When you print, are you printing in normal mode or draft? If your answer was normal, you’re costing yourself a significant amount of money each year in ink costs. When you go to print something, click the properties button and change it to draft mode. It will print in black and white only, but it will also use less ink. Less ink means you’re paying less. We pretty much print in draft all of the time unless we absolutely have to have something in color. We all know that printing something with only a few lines on it is a great way to waste money, but have you thought about how much money printing half pages is costing you? Have you ever printed a single printable coupon? If so, you’ve likely noticed that they usually print with a huge ad below the coupon. Guess what? Because you printed that huge ad? You’ve now wasted more money than that coupon is likely going to save you (unless it is a high dollar coupon). It would have been cheaper for you to print a second coupon that you weren’t going to use than a 1/2 or 3/4 page full-color ad. By staying aware of how many half pages you’re printing, you’ll print less waste and by default, you’ll save money. There you have it. Seven more ways to save money on printer ink. Do you have any others that I didn’t mention? I’d love to hear them!